12/23/2008 NOTE: PHOTOS ON THIS PAGE/REPORT ARE >RECONSTRUCTIONS<, THEY ARE PHOTOGRAPHS TAKEN BY DARRYL BARKER PRODUCTIONS AFTER THE EVENT AND DURING THE INVESTIGATION. WORKING IN CONJUNCTION WITH DETECTIVE LOPINOT, THE EXACT LOCATIONS WERE VISITED AND DARRYL BARKER PRODUCTIONS LATER SHOT 35mm IMAGES AT THE LOCATION OF UFO OBSERVATION BY THE WITNESS, DETECTIVE LOPINOT. SUPERIMPOSED ONTO THESE ACTUAL LOCATION PHOTOS, ARE RECONSTRUCTIONS OF THE FIVE LIGHTS OBSERVED BY DETECTIVE LOPINOT. REGARDING THE ST. LOUIS EXAMINER's ARTICLE, WHILE WE APPRECIATE THEIR ACKNOWLEDGMENT, THE EXAMINER STATES THAT THESE PHOTOS ARE "PURPORTED WITNESS PHOTOS". THE IMAGES ON THIS PAGE WERE NOT TAKEN BY DETECTIVE LOPINOT. THE IMAGES IN THIS REPORT ARE HOWEVER, VERIFIED BY DETECTIVE LOPINOT AS ACCURATE RECONSTRUCTIONS OF WHAT HE OBSERVED OVER O'FALLON, ILLINOIS ON JANUARY 5, 2000. THIS FIRST HAND REPORT WAS ADDRESSED BY PETER JENNINGS' "DOCUMENTARY, UFOS: SEEING IS BELIEVING". THE JENNINGS' TEAM UNFORTUNATELY, DID NOT ACCURATELY REPRODUCE THE UFO IN THEIR CGI MODEL, BUT WE GIVE THEM CREDIT FOR TAKING ON THIS POSSIBLY IMPORTANT COMPONENT OF THE JANUARY 5, 2000 TRIANGLE CASE. The following video clips are protected by U.S. Copyright Law. They are made available to the public in the pursuit of freedom of information. These video clips shall not recorded or copied for commercial purposes. Should any party wish to link to these clips or acquire original footage from this July 22, 2002 interview with Detective Lopinot, contact Darryl Barker Productions. On July 22, 2002, I interviewed Detective Mark Lopinot of the O’Fallon, Illinois police department. 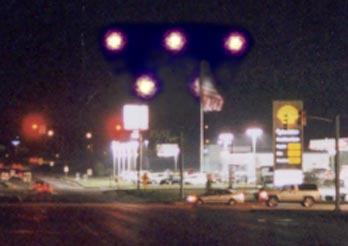 I had heard from one of the other officers that a policeman in O’Fallon had also seen the UFO of January 5, 2000. Detective Lopinot first thought the lights were five helicopters flying in formation, because they covered such a large expanse of night sky; but he soon realized after he rolled down his window, that the lights were totally silent and appeared to be connected, attached to a single object, as all 5 lights moved in perfect unison. Lopinot also noticed that the lights were moving very slowly, so slow as to constitute a stall for a normal prop or jet aircraft. He wondered if the object might be a blimp, but again, no sound could be heard from any kind of engine typically used on lighter than air vehicles. 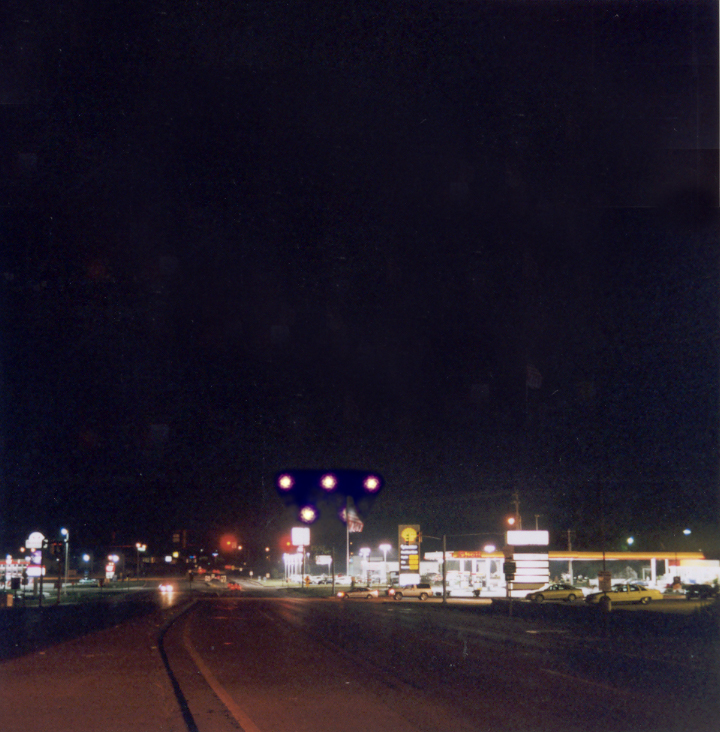 When Lopinot first saw the lights, he observed that they were to the east, beyond the Convenient Food Mart located near the junction of Highway 50 and State Street. As Detective Lopinot continued to slowly drive (10-20mph) east on Highway 50, he observed the lights, still in unison, approaching him, moving in a northwesterly direction. As he approached a Shell gasoline station on Highway 50 in O’Fallon, the massive lighting arrangement had now passed over the Convenient Food Mart, approaching Lopinot and maintaining the fixed pattern. The only sense of perspective Detective Lopinot observed on the UFO was when the two lower lights would fade out at times and then fade back in, as if they were being intermittently blocked from view. The two lower lights appeared to be at a greater distance than the top row, both by slightly less intensity, and also by their fading from view, which elicited some sense of depth to the unseen structure behind the lights, which was possibly at an angle. 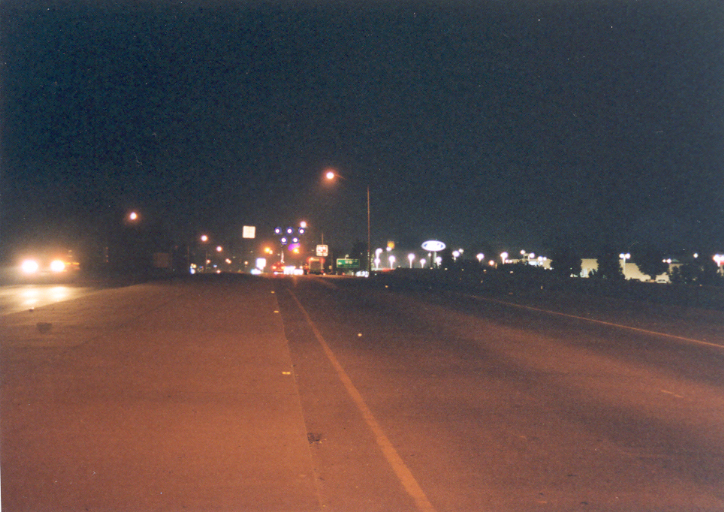 As Detective Lopinot’s police car approached the Jack Schmitt Oldsmobile Dealer (still on Highway 50 eastbound), he saw perhaps the strangest detail of the sighting: the 5 lights, now about 500 feet off the ground and just to the right and south of Highway 50 stopped moving toward him and proceeded to make what Lopinot described as a 90 degree turn or change in direction; that is, the 5 lights, still in a perfectly locked formation, moved to Lopinot’s right, which is Southwest on a map of the area. As Lopinot reached the location at which the lights made the 90 degree turn, Lopinot watched the lights moving away from him over a field and then over the tree tops, where they went out of view. One strange detail observed by Lopinot was that as the lights moved south and away from him, they never changed their relationship to him as an observer. Whatever angle Lopinot viewed the lights from, they remained fixed in two rows, three on top and two on bottom. 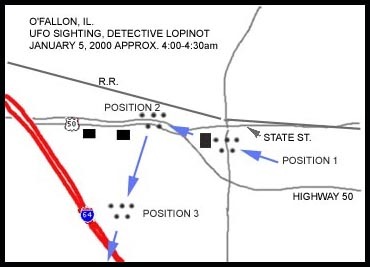 Detective Lopinot’s sighting took place approximately 2 hours before the end of his shift, which places the sighting between 4:00 and 4:30am on January 5, 2000. Lopinot did not note the exact time, nor did he think the object was anything other than “something from Scott” Air Force Base. Hence, he said nothing of the incident until he heard the news the next day about the sighting by other officers in St. Clair County. Detective Lopinot could not discern any shape of an object. The night sky was very dark; however, the area covered by the fixed lights was unmistakably large: estimated to be larger than the wingspan of a 747 (211 ft.). The object shoots away from the Lebanon Officer at 4:23:06am; actually arrives over O’Fallon, Highway 50 and is observed by Detective Lopinot for the 45 seconds between Lebanon Officer Barton stating the object is near Scott AFB at 4:23:12am and Officer Martin actually making visual contact with the UFO in Shiloh at 4:23:57am. Again, this cannot be proven, but this new piece of the puzzle gives us something to ponder. Of course, there is the possibility that the “object” seen by Detective Lopinot was actually a second aircraft of unknown origin, but this leads to an entirely separate set of questions which will be discussed later. There is also the possibility that the object was seen by Detective Lopinot in a time frame outside this very tight temporal window. 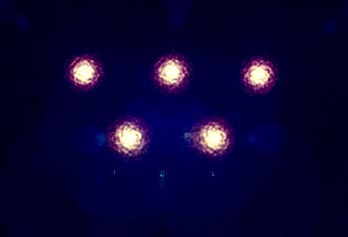 IMAGE 6: Reconstruction of lights aboard UFO as described by witness. Three amber lights in top row, two in bottom. Purplish tinge seen at times. Lights could be likened to seeing a point light source through rain water covered glass, resulting in a kind of :movement" of the light. The five lights never changed their positions relative to one another. THE DEBATE: ALIEN OR HUMAN TECHNOLOGY? 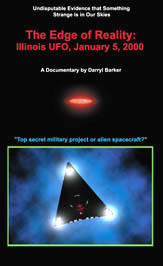 On July 23, 2002, the National Institute for Discovery Science, NIDS, proposed a hypothesis that the UFO seen over Illinois on January 5, 2000, was a U.S. Department of Defense, "Black Program" aircraft. The public must be reminded that although the media may portray NIDS' report as a solution to this case, it is not a solution; it is a hypothesis. 9/4/04 UPDATE: We are pleased to see the latest August, 2004 reassessment of the flying triangle enigma by the people at NIDS at: http://www.nidsci.org/articles/8_25trireport.php NIDS' cumulative mapping of triangle sightings across the United States is cause for some serious concern by the United States government and the U.S. military. * Darryl Barker is an independent film and video producer. His documentary program "The Edge of Reality: Illinois UFO, January 5, 2000" investigates, in-depth, the January 5, 2000, sighting of the massive triangular UFO seen over Illinois. An unidentified party is sending e-mail with attachments containing a virus to various e-mail accounts and making it appear that the e-mail originated from this website. Be advised that no party at Darryl Barker Productions is sending e-mail with virus-laden attachments. All content on this page is Copyright 2001- 2010 Darryl Barker Productions.